The psychiatrist William Breitbart lives at the edge of life and death. As chairman of the Department of Psychiatry and Behavioral Sciences at Memorial Sloan Kettering Cancer Center in New York, Breitbart specializes in end-of-life care for terminally ill cancer patients. For many of his patients, the most pressing question isn’t when they’ll die or how painful death will be. Rather, it’s what makes life meaningful. They are in search of a meaning that cannot be destroyed by death. Breitbart has spent the better part of his career trying to answer that question. His ground-breaking research shows that while the specter of death often leads people to conclude that their lives are meaningless, it can also be a catalyst for them to work out, as they never have before, the meaning of their lives. When people believe their lives are meaningful, according to psychologists, it’s because three conditions have been satisfied: They feel their existence is valued by others; they are driven by a sense of purpose, or important life goals; and they understand their lives as coherent and integrated. Psychologists and philosophers say that the path to meaning lies in connecting and contributing to something that is bigger than the self, like family, country, or God. Meaning and death, Breitbart believes, are the two sides of the same coin—the fundamental problems of the human condition. How should a human being live a finite life? How can we face death with dignity and not despair? What redeems the fact that we will die? These questions roll around Breitbart’s mind every day as he works with patients facing life’s end. Breitbart’s interest in meaning took root in his childhood. Born in 1951, Breitbart grew up on the Lower East Side of Manhattan. His parents, Jews from eastern Poland, narrowly avoided Hitler’s death camps. When they moved to America, they carried their memories of the war years with them. Breitbart’s childhood was steeped in that tragic past. Every morning, his mother would ask him at the breakfast table, “Why am I here?” Why, she wondered, did she live when so many others had died? If death means non-existence, Breitbart’s patients reasoned, then what meaning could life possibly have? And if life has no meaning, there’s no point of suffering through cancer. By the ’90s, physician-assisted suicide was a hot topic in Breitbart’s circles and beyond. The doctor Jack Kevorkian had helped his first patient end her life in 1990. As the United States debated the ethics of assisted suicide, other countries were taking steps toward normalizing the practice. In 2000, the Netherlands became the first nation to make physician-assisted suicide legal. Today the practice is legal in the United States in California, Vermont, Montana, Washington, and Oregon. As Breitbart heard more stories of assisted suicide, he began to wonder what specifically was driving the terminally ill to give up on life. At the time, he was doing research studies on pain and fatigue at the end of life, so he tacked onto those studies some questions that asked his subjects whether they felt a desire for a hastened death. What he discovered surprised him. The assumption had been that the ill chose to end their lives because they were in terrible pain. But Breitbart and his colleagues found that wasn’t always the case. Instead, those who desired a hastened death reported feelings of meaninglessness, depression, and hopelessness. When Breitbart asked patients why they wanted a prescription for assisted suicide, many said it was because they had lost meaning in life. Unlike clinical depression, which has a specific set of diagnosable symptoms, meaninglessness was more of an “existential concern,” Breitbart said—a belief that one’s life has little value or purpose and is, therefore, not worth living. Breitbart became convinced that if he could help patients build meaning, he could decrease their suicidal thoughts and make their lives worth living even to the very end. He developed an eight-session group therapy program where six to eight cancer patients come together in a counseling workshop. Each session, in one way or another, helps build meaning. In the first session, for example, the patients are asked to reflect on “one or two experiences or moments when life has felt particularly meaningful to you.” In the second session, patients respond to the question “Who am I?” to tap into the identities that give them the most meaning. One woman responded saying, “I’m somebody who can be very private ... [and] have been working on accepting love and affection and other gifts from other people.” In subsequent sessions, they share their life story with the group and think about the role that love, beauty, and humor played in their lives. Breitbart performed three randomized, controlled experiments on the meaning-centered psychotherapy. When he analyzed the results with his colleagues, Breitbart saw the therapy had been transformative. By the end of the eight sessions, the patients’ attitudes toward life and death had changed. They were less hopeless and anxious about the prospect of death than they were before they began the program. They no longer wanted to die. Their spiritual wellbeing improved. They reported a higher quality of life. And, of course, they found life to be more meaningful. These effects not only persisted over time—they actually got stronger. When Breitbart followed up with one group of patients two months later, he found that their reports of meaning and spiritual wellbeing had increased, while their feelings of anxiety, hopelessness, and desire for death had decreased. The time between diagnosis and death, Breitbart has found, presents an opportunity for “extraordinary growth.” One woman, for example, was initially devastated by her diagnosis of colon cancer—but after enrolling in the therapy program, she realized, “I didn’t have to work so hard to find the meaning of life. It was being handed to me everywhere I looked.” And that realization ultimately brought her—and Breitbart’s other patients—some measure of peace and consolation as they faced life’s final challenge. 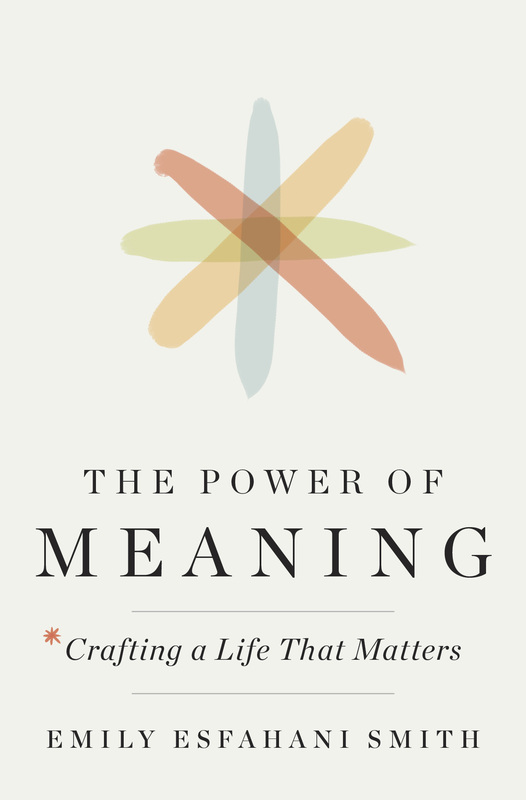 This article has been adapted from Emily Esfahani Smith’s book, The Power of Meaning. Emily Esfahani Smith is a writer based in Washington, D.C. She is the author of The Power of Meaning: Crafting a Life That Matters.